I created a Frantic Mama profile on Pinterest a while ago, and I'm just now trying to figure out how to use it in a way that makes sense for me as a writer and as a mother. I'm definitely not making rainbow-hued spaghetti anytime soon, nor am I planning on making playdough from scratch (they sell play-doh for a reason, right?). But Pinterest is a cool way to share and read other people's blogs and make new connections. Meredith @ Perfection Pending has started a board Blogs you Should be Reading that I (and other writers) share posts on regularly. Be sure to check it out if you have a chance. I've also figured out how to add "pin it" buttons when you hover over an image on my blog. To do so, I had to add HTML code to my template! Yes, seriously! I'm surprised at how much tech stuff I've learned by working on this blog. So I'd love to hear from you: What are your favorite things about Pinterest? How often do you use it? Do you find it inspiring or guilt-inducing? (And if you tell me your Pinterest page, I'll be sure to follow you). 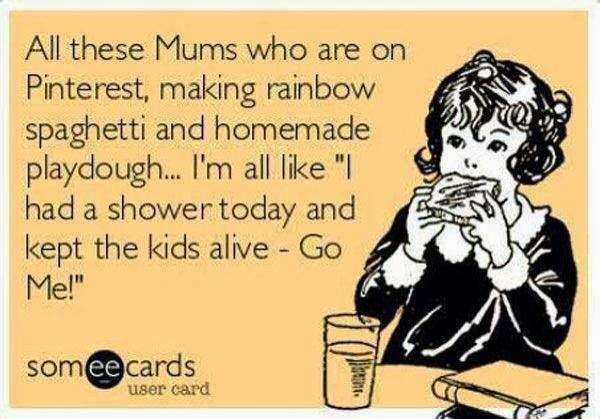 *Find me on Pinterest as Frantic Mama to see if I've made any headway.